Thanks engender for your continued support! The showroom looked great, thanks Fusion! Lily was spotted in the Broyhill showroom at Market! A little over two years have passed since the concept of Revolution Performance Fabrics® became a reality. 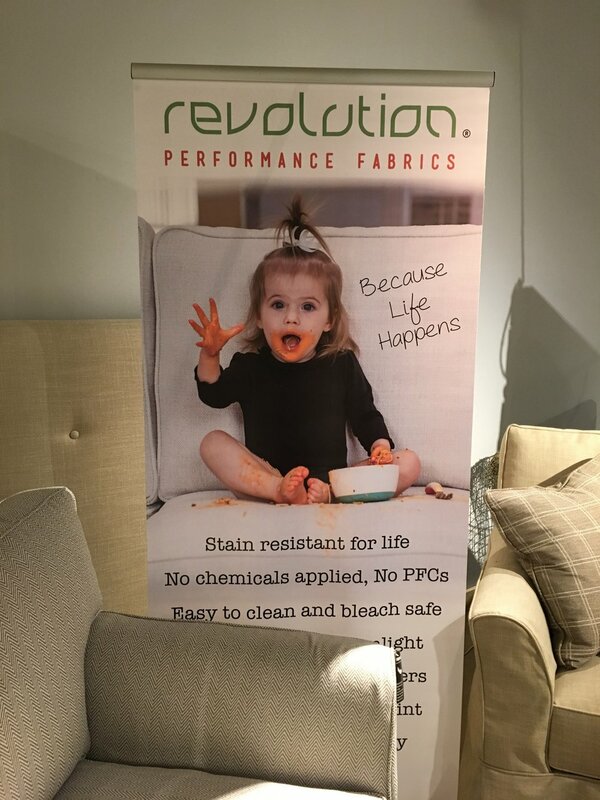 As part fabric designer and part graphic artist, I had the pleasure of developing the now widely recognized Revolution logos and point of purchase materials such as posters and banners. As the Revolution brand grew, we expanded these POP materials to include promotional items such as pens, note pads, and even large billboards pulled by trucks (which you may have seen at the past two Furniture Markets in High Point, NC). There’s nothing quite like being on the creative end of Revolution’s identity, and then being able to design Revolution fabrics. Our growth in the first two years has been phenomenal, but just wait. . . you haven’t seen anything yet! Norwalk has got it going on!